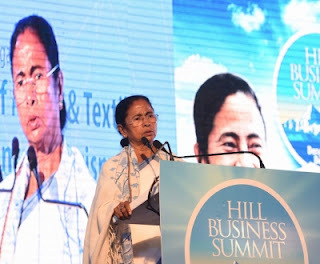 Darjeeling: Mamata Banerjee announced on Wednesday that the two-day business summit had elicited proposals for private investments of Rs 1,500 crore in the Darjeeling hills. "I am happy that my industrialist friends discussed and agreed to invest around Rs 1,500 crore. This is a beginning and now, we have an opportunity," the chief minister said at the closing ceremony of the Hill Business Summit at Chowrastha here. Sources said the investment proposals had largely come from food processing and hospitality industries. "The CII (Confederation of Indian Industry) has charted a road map and more investments will flow," said Mamata. According to the sources, private investment proposals for another Rs 500 crore are being discussed. There are also plans by various government departments to set up a floating handicraft market on Mirik lake and IT parks; and provide support for ginger processing, honey extraction and tulsi oil distillation unit. Mamata Banerjee announced on Wednesday that the two-day business summit had elicited proposals for private investments of Rs 1,500 crore in the Darjeeling hills.